It was only a matter of time before some of the craziness of the modular world came to desktop synths, too. Arturia’s new MicroFreak is a budget keyboard with a weird streak. $349 (299 EUR) – coming this spring. A matrix for modulation (something associated with synths like the ARP 2500). Randomization features in the step sequencer – various functions along the top “spice” and “dice” and otherwise rearrange your patterns. Oscillator features from Mutable Instruments’ open source Plaits engine – and modes like Karplus Strong (physical modeled strings/plucks), harmonic oscillators, and more exotic wavetables. 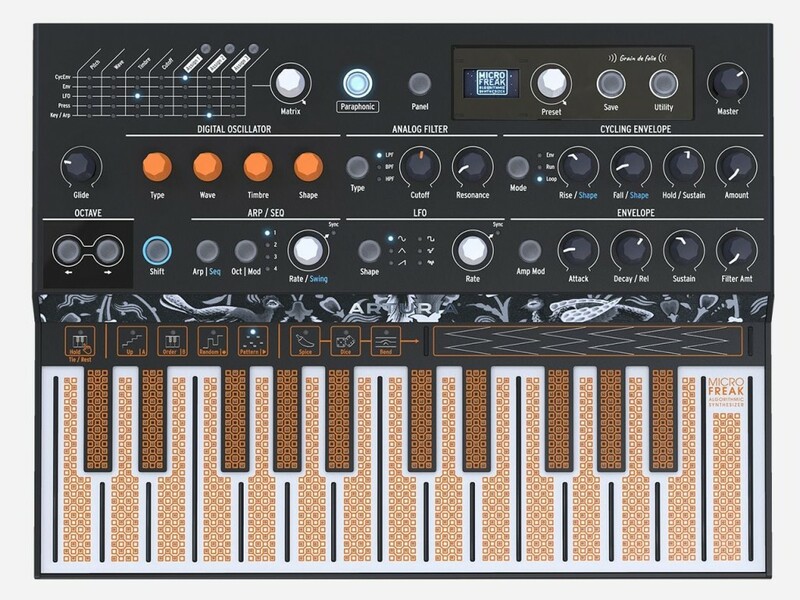 It’s still an Arturia design, no doubt – the digital oscillators get fed through an analog filter (this time the Oberheim SEM), and the preset storage and control knobs all look Arturia-like and more conventional. 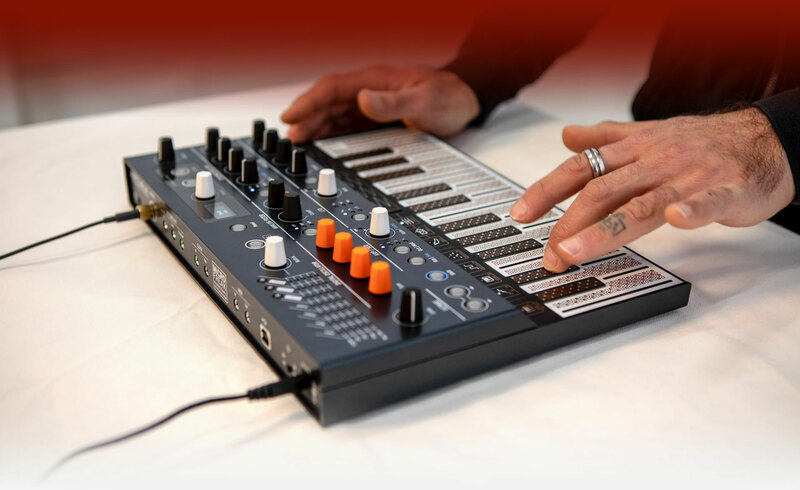 But it’s a blend between that and more leftfield hardware, in one very low-cost unit – $349 (299 EUR) this spring. The resulting design looks a little like it was pieced together from different bits – an ornate keyboard versus a more staid gray body, plus four glaring traffic cone orange knob caps. But that price is terrific, especially considering a lot of modular cases start at that price – let alone what you’d need to even begin to approach these possibilities here. And – the thinness is fantastic. It seems 2019 is a year of touch keyboards. Don Buchla would’ve been proud of us. So let’s get back to the Mutable Instruments oscillators, which are one of the more interesting features here. We’ve confirmed that Mutable Instruments and founder/designer Emilie were not directly involved in the design, though she did sign off on the mention of the company name. You can find Mutable Instruments’ DSP code in the Korg Prologue, the Axoloti, the Organelle, VCV Rack, and plenty of other bits of software or hardware. This is not stealing. Plaits’ code is a summary of everything I’ve learnt about making rich and balanced sound sources controlled by a few parameters, it’s for everyone to enjoy. Arturia’s coders have slightly modified these in some cases – for instance, new chords in the Chords mode. To me, those Arturia additions really anchor this offering, with some pretty fundamental ideas on offer. Put them together, and you should have something really versatile. But okay, since Mutable Instruments doesn’t get any of your money when you buy the Arturia MicroFreak, did Mutable just give away the store by using an open source license? 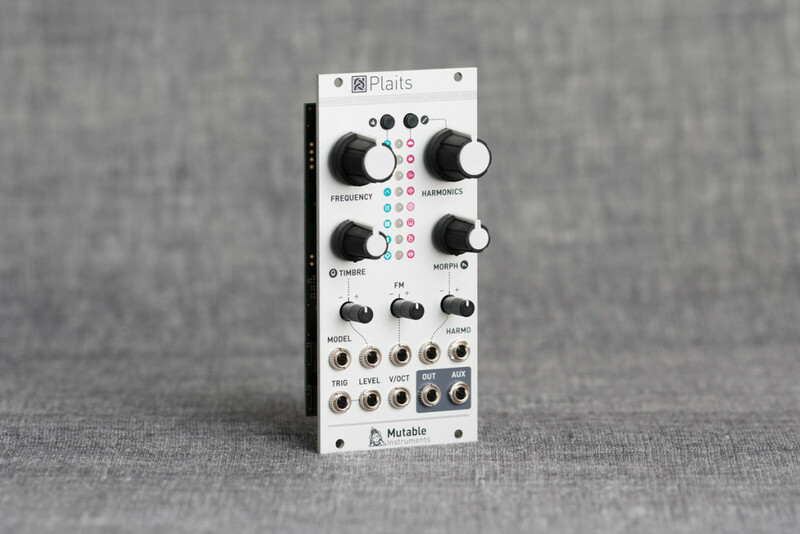 Well, no, not really – Plaits gives you a full 16 modes, an internal low pass gate, and does all its 32-bit floating point math in hardware that you can bolt into a modular case and interconnect via control voltage. Plus, you can get Plaits in software if you like – see the Audible Instruments Preview for VCV Rack, regularly updated.